THE STORY - Through a series of daring escapades, young Han Solo meets his future co-pilot Chewbacca and encounters the notorious gambler Lando Calrissian. THE GOOD - "Star Wars" remembers how to have fun again with a light story showcasing one of the franchise's most beloved characters. The nods to the original trilogy will bring about rushes of nostalgia. THE BAD - Do we really need to see this backstory for this particular character? Writing is hit or miss. Ugly cinematography. ​There is a sense of wonder that is slowly being chipped away at for every line of dialogue, piece of backstory or mythology that gets explored in the “Star Wars” prequels and now spin-offs. Questions we once asked ourselves and had to use our imagination in order to fill in the blanks is gradually lessening the impact of the original trilogy. With “Solo: A Star Wars Story,” we are receiving yet another spin-off film which is introducing us to a beloved character and building an entire plot around one line of dialogue from 1977’s “A New Hope” when Han Solo says how the Millennium Falcon “made the Kessel Run in less than twelve parsecs.” The issue is that “Solo: A Star Wars Story” is not so much concerned with forging its own identity for itself, (Despite it’s best efforts to be a team-building heist film) and is instead content with making nods to the original trilogy wherever it can to elicit a crowd reaction. This is pure fan service and sometimes it is fun but maybe, just maybe, we don’t necessarily need to be shown everything for the sake of it. “Solo: A Star Wars Story” introduces us to a younger Han Solo (Alden Ehrenreich) on the slum planet Corellia, madly in love with Qi'ra (Emilia Clarke). The two make a daring escape off the planet but get separated in the process. Han goes into business with a smuggler Tobias Beckett (Woody Harrelson) and his crew to pull off a dangerous job which will see them all get paid by crime lord Dryden Vos (Paul Bettany). Once Han has the money he needs, he’s going to go back to his home planet and save his girl. Along the way, he meets a Wookie named Chewbacca (Joonas Suotamo) and a suave, flamboyant pilot named Lando Calrissian (Donald Glover) who the team employs to utilize his ship the Millennium Falcon to pull off the dangerous heist and complete their mission. “Solo: A Star Wars Story” went through a heavily publicized director turnover mid-way through production when Phil Lord and Chris Miller were booted from the project for creative differences. Competent, reliable and Academy Award-winning director Ron Howard (“Apollo 13” & “A Beautiful Mind”) was brought on by producer Kathleen Kennedy to finish the job. The final product is not a failure for this series on the levels as the prequels. In fact, I would argue that the very tone of this (And “Rogue One” took two years ago) is exactly the kind of approach the prequels needed. “Solo” is enjoyable, funny and does exactly what it sets out to do. So why is it so unremarkable then? The first issue that jumps out at me is the characters. As played by Alden Ehrenreich (The breakout star of 2016’s “Hail, Caesar!”), Han is arrogant, charming and is that anti-hero that Harrison Ford iconically gave us. There are even moments where he starts to look like Han. However, whether it was because of the change in directors or Alden simply wanted to do his own take on the character, there are times where his performance does not embody the spirit of the character. All of the characteristics I described before are ones which screenwriters Jonathan Kasdan and Lawrence Kasdan have given to Alden but the young actor doesn’t try to act or sound like Harrison Ford at all. With a personality as distinguishable as Harrison Ford, how hard can this possibly be? Someone who fares much better in this respect is Donald Glover as Lando Calrissian (Yes, the pansexual comments about his character are really in the film itself). His confidence, suave nature and pitch-perfect bits of comedy completely embody the original character Billy Dee Williams once gave us and gives the film a much needed shot in the arm midway through. The Han and Chewbaaca relationship is also explored in terms of how they met and how they became as close as they did. This is another area that works well but when it comes to introducing new characters, that is where “Solo” starts to show some more of its flaws. One of the biggest issues with the “Star Wars” Prequels is that they gave us thin characters who were soulless and boring despite their actions and mammoths amount of dialogue. This time around, the most interesting characters are either killed off too soon before we get to fully know and appreciate them or they fall into the same trap as the prequels did where they lack interesting traits that made the original characters resonate with an entire generation. Paul Bettany does a terrific job as the film’s villain but much like Woody Harrelson’s smuggler who acts as a mentor to Han, where are their backstories? Where are their definable traits which make them stand out? Same goes for Emilia Clarke who plays Qi'ra. However, her character has barely scratched the surface of her full potential and will no doubt be explored in a future film where the adventures of Han Solo will continue, hopefully with less reliance on the original trilogy’s nostalgia and instead with more interesting characters and story. 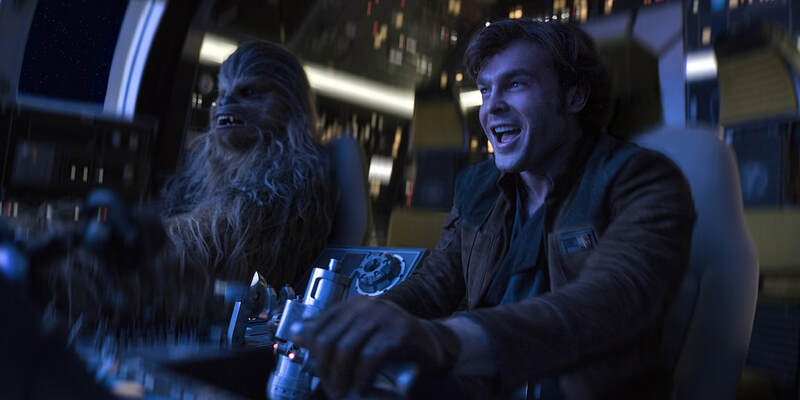 On the technical side, “Solo: A Star Wars Story” lacks any memorable sequences or set pieces that fully jump out at you. The Kessel Run is the moment which the entire film is building up to and even though it has its own fair share of spectacle attributed to it, it still carries this feeling of “Been there, done that.” How many times have we seen the Millennium Falcon manage to escape at the last minute? How many times have we seen blasters go off and shoot imperial troops? We’re at a point where “Star Wars” films are being delivered once a year and this is the first one where I genuinely am starting to feel less of a surge in creativity and more of a lazy reliance on our love for the franchise. It also hurts that “Solo” carries with it some of the most off-putting cinematography of the franchise yet from Bradford Young (“Arrival”), who has a distinct style that favors deep, washed out blacks. However, that look is one that only helps to muddy the images and erase some of the lightness and levity which this film is trying to bring back to audiences after the darker stories of “Rogue One” and “The Last Jedi.” Despite, not having John Williams on board again, the musical score is quite good while the costumes, sets, and make-up all remind us why we love “Star Wars” in the first place. Even though, I think it is more of a mixed bag than “Rogue One” was two years ago, “Solo: A Star Wars Story” is not the flat-out disaster it could’ve been despite its production issues and lack of enthusiasm from fans. There is certainly a lot to appreciate here including a few surprises, some laughs and clever easter eggs sprinkled throughout. While I still don’t think we actually needed to see this story about a younger Han Solo, how he got his name, his blaster, how he made the Kessel Run, how he met Chewie and Lando and set off on a course to become the dashing, bad boy smuggler that we know and love, I am still on board for the ride. However, this is the one time where I feel my lack of faith is not disturbing, but valid. Time will only tell and we won’t have to wait too long when the eventual sequel releases to find out either.